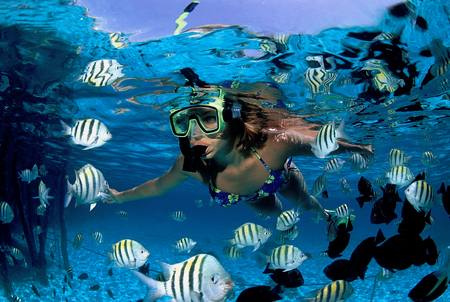 The Caribbean is the first-choice foreign destination for divers from the United States and Canada. The area is sub-tropical and stretches from the north coast of South America to the Gulf of Mexico. It is enclosed by the Leeward and Windward Islands on its eastern side. The south coast of Cuba is the northern boundary of the Caribbean Sea, but for the purposes of diving, the islands of the Turks and Caicos, the Bahamas, which are dotted across the Atlantic from Cuba to Florida, and the Florida Keys are included in the Caribbean area. The best time to go is during the first half of the year, when the weather is settled, although there can be rain at any time. During the late summer and early autumn, big storms can develop, even becoming hurricanes. Most of the islands of the Caribbean have white, sandy beaches. There are some exceptions, including the volcanic island of St Lucia with its black sand. Destinations famous for diving include: the sponge-clad walls of Bonaire in the Netherlands Antilles, the fast drift dives of Cancun in Mexico, the steep walls of the Cayman Islands, the spectacular wreck of the Italian cruise liner the Bianca Cin Grenada, the untouched marine park of Grand Turk in the Turks and Caicos Islands, and the shark-populated reefs of the Bahamas. Every island in the Caribbean area that is surrounded by deep water can provide high-quality diving that is often relatively unchallenging. Visibility tends to be very good all year round. The soft corals of the Caribbean are of the less colourful type, but there are always plenty of fish to be encountered. They have mostly evolved as entirely different species from those found in the Indo-Pacific region. Caribbean species include the striped Nassau grouper and the large schools of yellow-striped grunts that loiter around reef tops. Other brightly coloured fish that can be seen in groups include the golden schoolmasters. There are many types of angelfish that usually browse the coral heads in pairs. They include the yellow-and-black French angelfish and the grey angelfish. Large, colourful tube sponges adorn the reef walls, where the water plunges to hundreds of feet deep. Some of the best dives of the Caribbean area are wall dives. The ubiquitous common octopus stalks the reef top, looking for shellfish that form the majority of its prey. It always provides good entertainment as it can change its colour, form and texture at a moment’s notice to camouflage itself against the background of the seafloor. If you are interested in the tiny and bizarre creatures that are often found in the seabed, the island of St. Vincent is rapidly developing a reputation as the macrolife capital of the Caribbean. Grand Cayman is famous for its large population of southern stingrays. The islands of the Caribbean always provide good facilities for diving, and they usually have excellent flight connections with major bubs, such as Miami. They have some of the best and, consequently, most expensive hotels in the world, although it is also possible to visit on a small budget.